Down, Set, Hut Hut Hut! Hello everyone! Maureen Anders of Anders Ruff here. 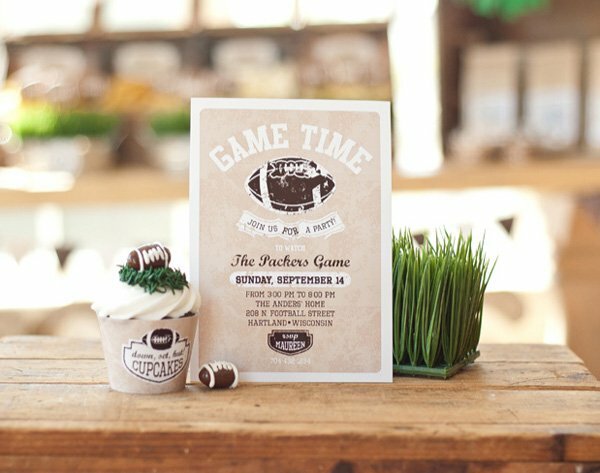 Today, I’m excited to share my Neutral & Rustic Style Football Party, which kicks off football season in style. 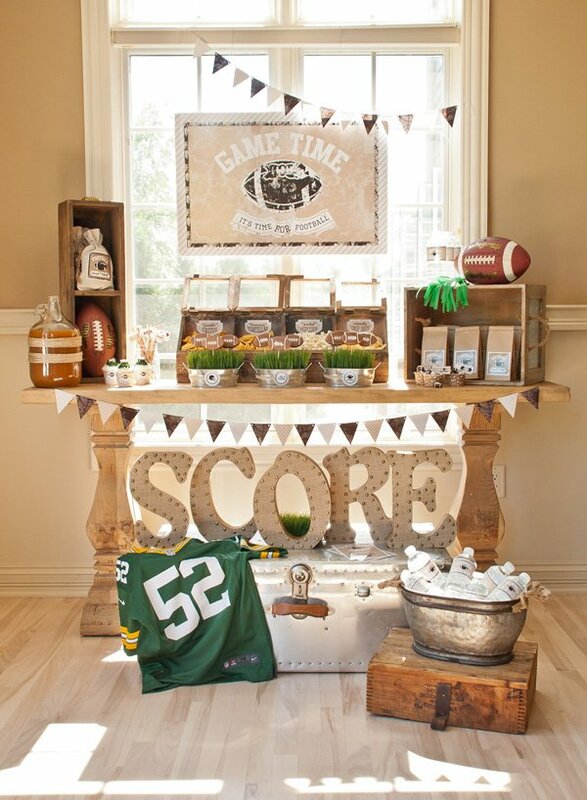 Vintage styled graphics in neutral tones helps make this setup versatile for any team that you may be rooting for. 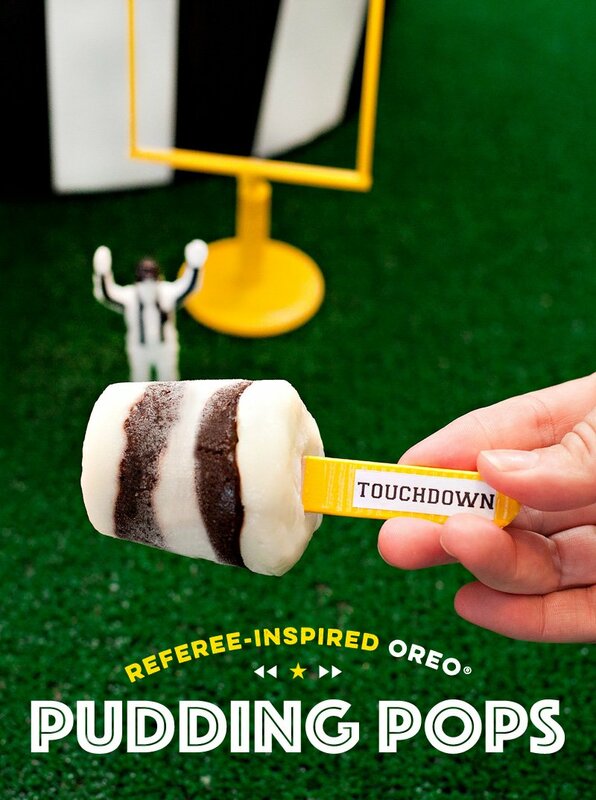 Mix in your own team colors, your favorite game-time snacks and your party will be off to a great start! 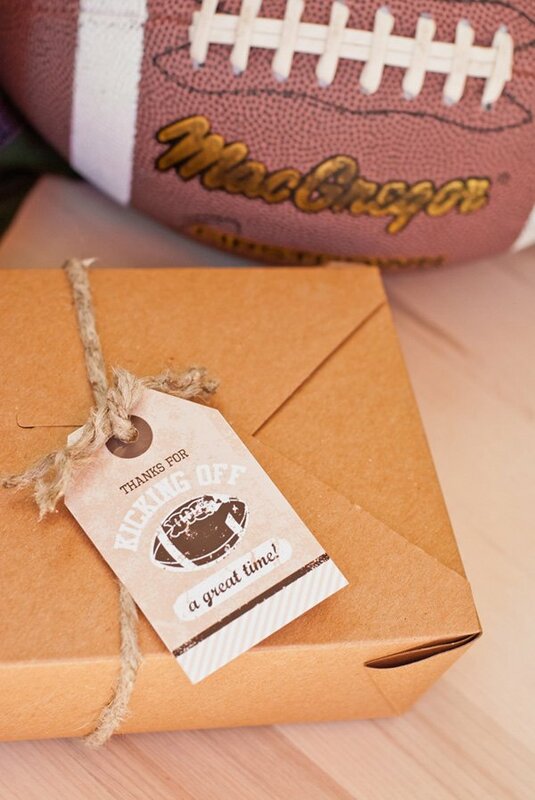 I had so much fun planning this Vintage Football Party for my husband’s group of colleagues. 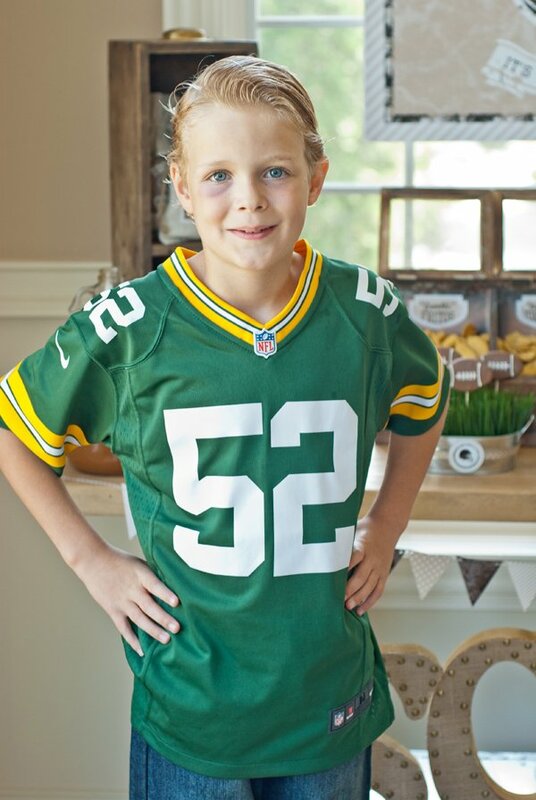 He has been asking for us to have a football party, and now that we moved to Wisconsin, I know we have some Packers fanatics here! I wanted to keep the palette neutral so that it went with any team colors. This is SO fun to work with because its a mix of tans, browns, white, creams. 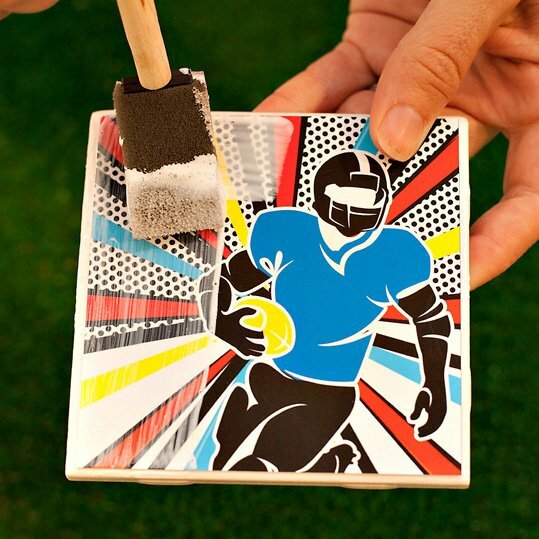 It goes with anyone’s home decor and is completely easy to mix in your own team colors. 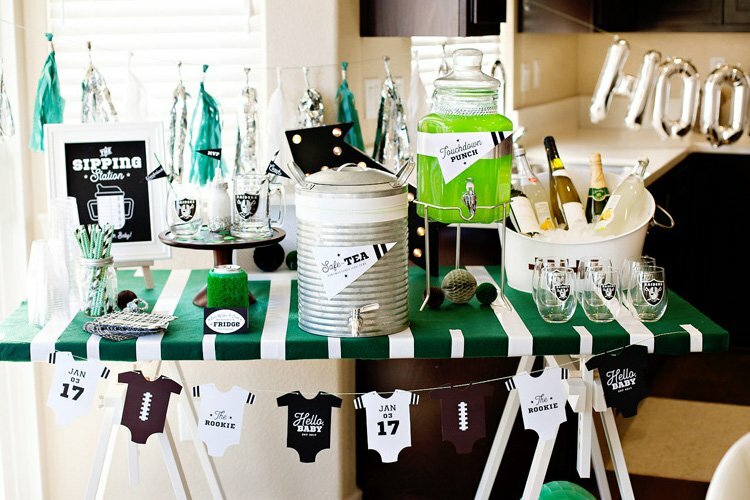 You could mix in tissue pops or tissue tassels, balloons, your favorite sport team jerseys or signs or props! 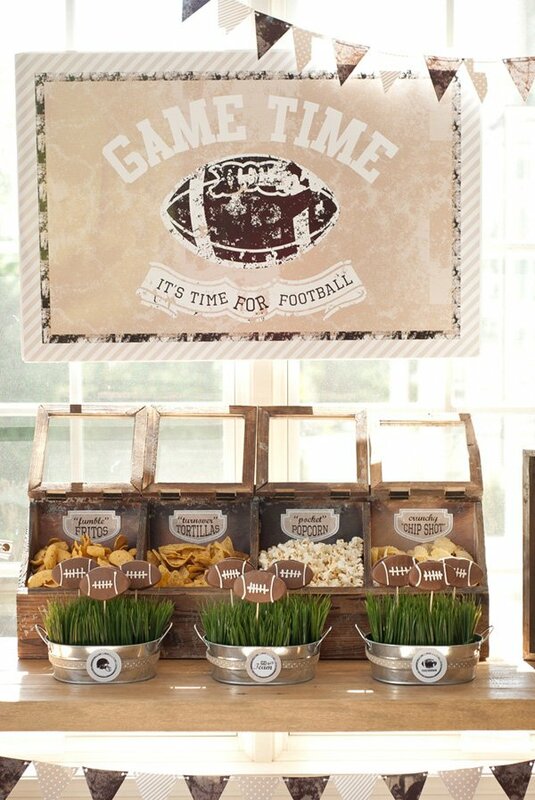 I displayed the football treats and snacks on my console table with a Metal Trunk below it. The silver trunk held wooden giant letters that spelled out “SCORE”. I also draped an extra jersey on the silver trunk to add a pop of color for our team. We put some water bottles (adorned with a printable drink wrapper) in a galvanized tub on the ground for people to grab as they grab some snacks. 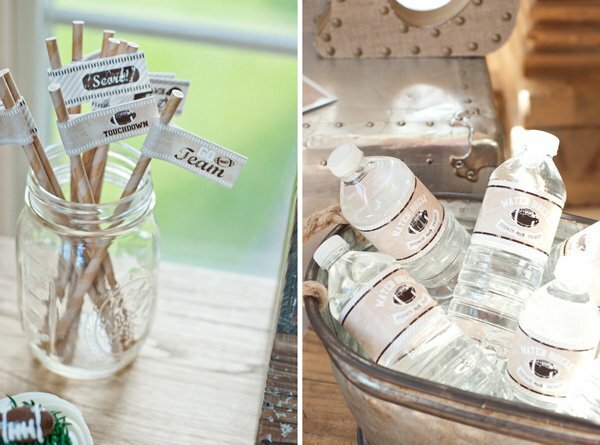 The table held some Mini Galvanized Tubs wrapped with cute burlap ribbon and a printable party logo from our collection. They each were filled with artificial wheat grass. 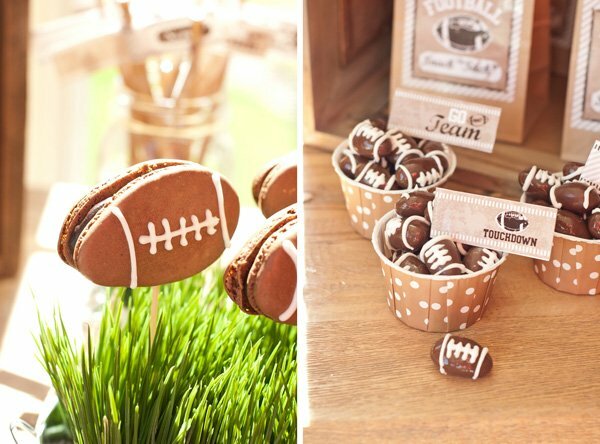 We made homemade Football Shaped Macarons and put them on sticks coming out of the grass. They were darling! We were inspired by Mindy Cone of Creative Juice and her macaron book is fabulous. 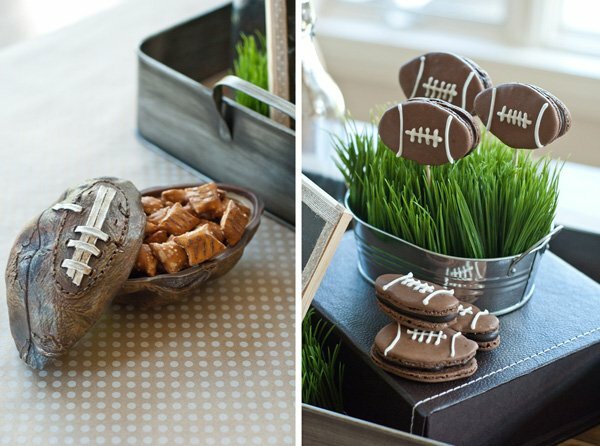 I wanted this table to not just be about sweets, since it was a football party after all! Everyone needs salty snacks, so I used a cool old fashioned candy box with window lids to display my salty snacks. We created a printable label and put on the backs of the container above the chips. I lined the wood box with white tissue so it was sanitary and didn’t ruin my antique. The names for the foods were so fun! 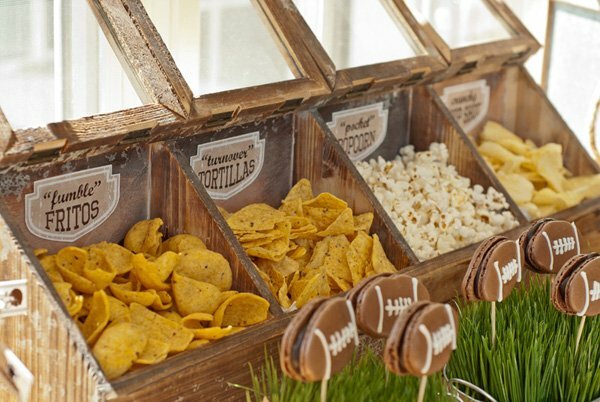 We served “Fumble Fritos,” “pocket popcorn,” “turnover tortillas” and “Crunchy Chip Shot.” The guests raved about the display. On the left side of the table I used an antique drawer upright and put a football in the bottom compartment and cotton bags with the “Football Snack Sack” iron on. We also had a big glass jug with apple cider (SO fall!). I wrapped it with twine to add some texture to the container. We had a mason jar full of paper straws decorated with our printable party flag. 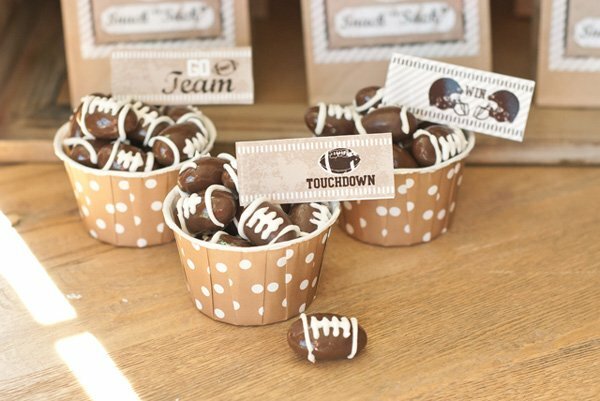 We also made the most adorable and easy football cupcakes! We asked our local grocery store (Target or Walmart also do cupcakes however you like them!) to make white cupcakes with a patch of dark green grass icing on top. Then we plunked a chocolate almond on top and added a printable cupcake wrapper. SO simple and everyone raved! For my tables, I kept it super simple. 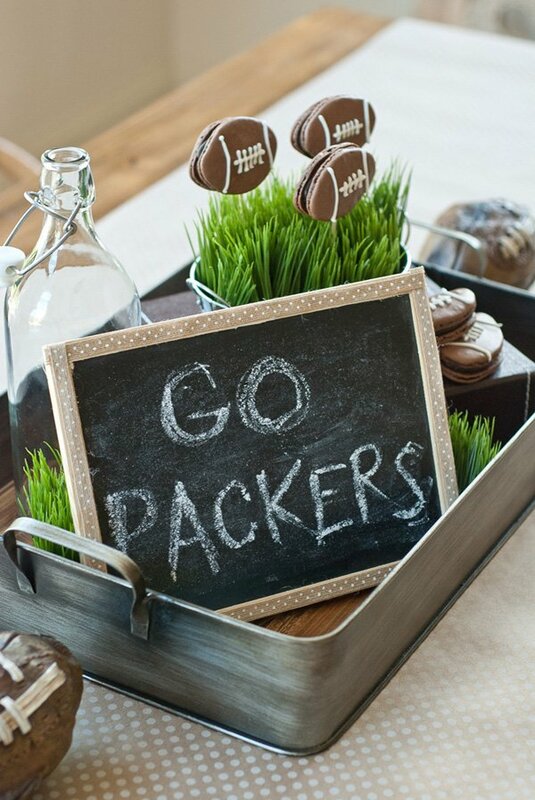 I lined the tables with kraft paper wrapping paper, and put a metal handled tray in the center with a chalkboard sign, glass bottle with more cider and I repeated the galvanized tubs with artificial wheat grass and football macarons. It looked darling and tied it all together. 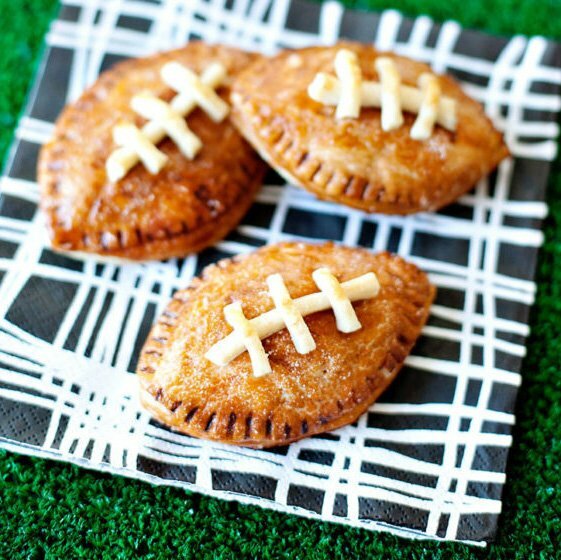 For the food, we served Game time Beef Chili, Vegetarian Chili, Victory Veggies, Buffalo Cheese curds, fumble fruit and the most delicious sandwiches — Kickin’ Buffalo Chicken Sandwiches! Yum diggity! Everyone raved about the food and display. 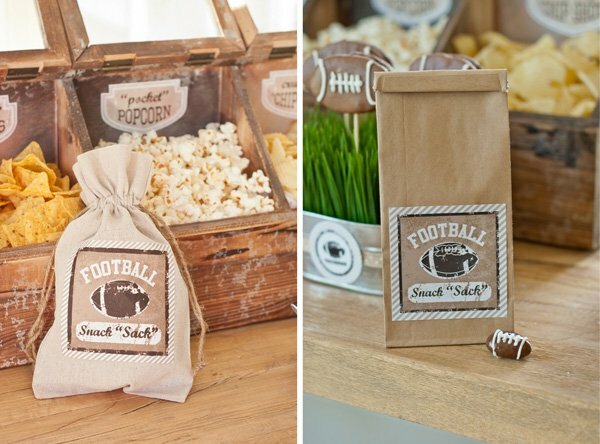 Find the vintage football party invitation and printable collection in the Anders Ruff shop. 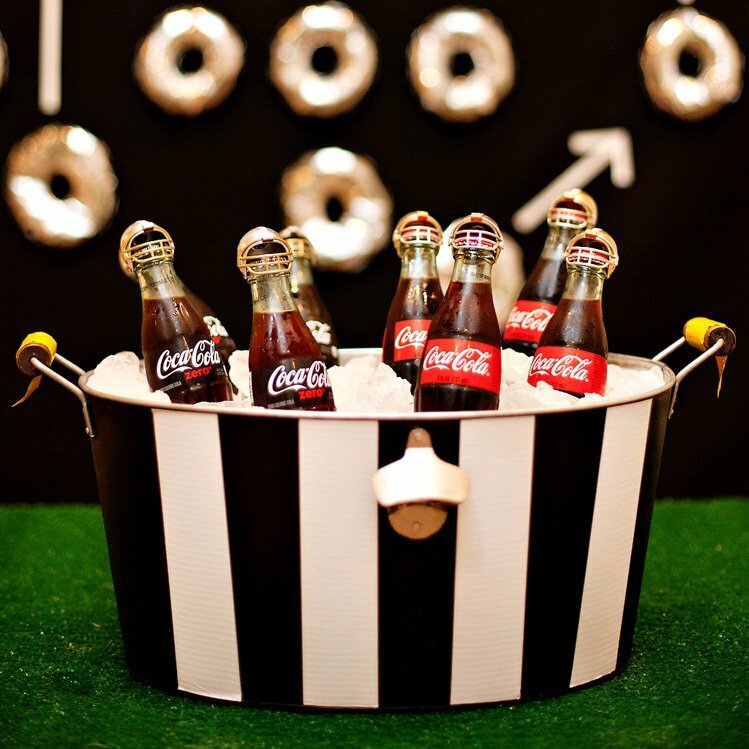 How great would this be for a birthday party or tailgate!? 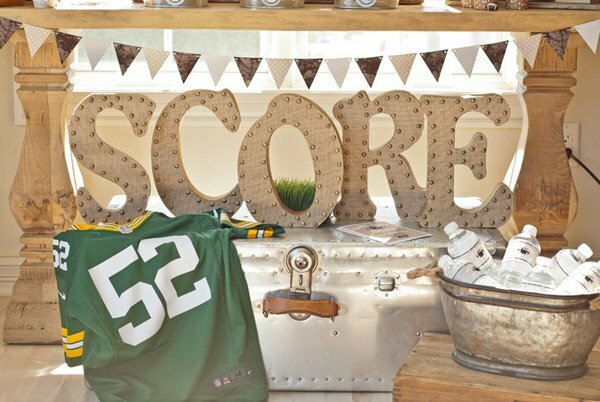 Where did you find the SCORE letters? where did you get the wood entry table an the wood thing the chips are in?